Magical race-winning superhero and donut enthusiast qualified first for tomorrow's U.S. Grand Prix in Austin, because of course he did. And after securing the pole following a tight battle with teammate Mark Webber, Vettel celebrated with an appropriately Texas remark: "Shake and bake, baby." 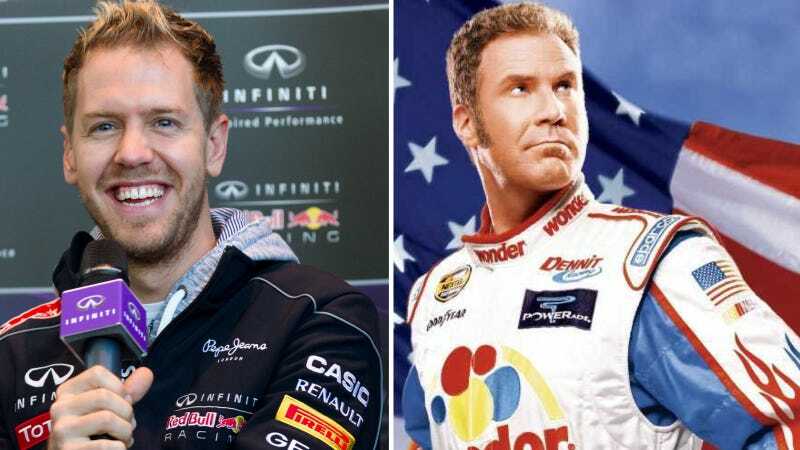 Asked to explain the Talladega Nights quote to an apparently clueless British journalist during a press conference, Vettel credited a Red Bull race engineer with the remark. "There was a movie a couple years ago about racing," Vettel said. "It was a nice quote. My engineer has a lot of history here... you need to ask him." I guess that makes Webber a sort of unwilling Cal Naughton Jr., right? He should grow that mustache. It would be a great look. Vettel narrowly snatched the pole from Webber, who was faster during earlier runs and had as much as a 0.4 second advantage over the now four-time world champ at one point. But in the end Vettel was able to take first with just a 0.1 second lead over Webber. Lotus' Romain Grosjean will start in third tomorrow, finishing qualifying 0.8 seconds behind Vettel. The full qualifying results from ESPN are below. If things keep going Vettel's way, we Americans could be in for more donuts out here at the Circuit of the Americas.